I seen one guy, the 50 year old with the thread, that started at the edge the decreased the router depth as he moved in to the middle, chiseling it after. So with the way you do, do you mean just rout once around the edge and use the sandpaper to blend a curve into it?? sorry if im not understanding.. Exactly. 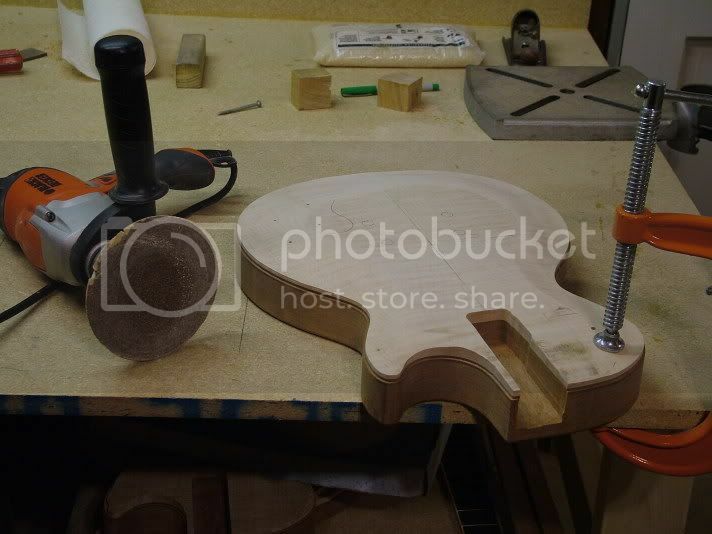 To me, the router step method is risky, somewhat dangerous, and you still have to blend it all by sanding anyway. It's all preference, but it's easier to clamp to the body (and get everything lined up properly) if you glue it on first. Carving first gives you the option of starting over if you mess up. 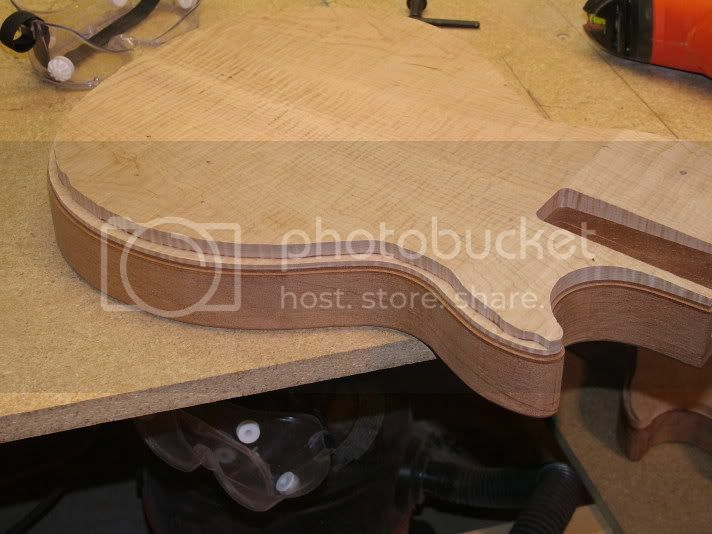 My method of carving, for what it's worth (I haven't seen anyone else do it this way) is route a uniform-depth rabbet around the edge of the guitar, then simply sand down to it using a sanding disk on a drill. It took less than two hours per top and was easy on the arms. I can't compare them directly to a Gibson because I've never actually played a Gibby LP plugged in. The burst sounds absolutely unbelieveable. It has Swineshead Runaways and it's pretty much everything I hoped for tone-wise. The blue one is still being set up but sounds alright but not great so far. It has GFS Vintage 59's which I'm honestly not thrilled with. The Goldtop sounds good but not great also. The GFS Mean 90's are decent pickups, but so far not my cup of tea. I'll probably keep them just for variety though. Maybe it's my imagination, but the burst seems to resonate a little better than the other two. The differences are an aluminum tailpiece on it as opposed to a heavier one on the others, and I left a small area of the body hollow on the others. The thing that makes the biggest difference though is that the burst is strung with 11-52's with a wound g. The other two have 10's. As far as price, I have a number in mind but I'm not sharing it until I've shopped around a little first. Hey pyro! I have been busy, but these are the only guitars I've built since then. It's mostly been sports and school. Good electronics in a crappy body is no worse than crappy electronics on a good body. I'm convinced that if you upgraded the pickups, electronics, hardware, and put a good neck on there, it would sound just fine. I'm not sure what you're refering to since I tried not to get them in the picture too much, but I tend to agree - they are by far the sloppiest part of the guitars. Yes, the blue one is for sale, but locally only. These are my first and I don't feel comfortable selling to someone who hasn't held it in their hands. It has too many "imperfections." I didn't keep track of costs, but even if I sold all three I'm sure I would lose money. You don't start doing this for profit. All three built from scratch, my first ever. My photography skills are terrible and the flourecent lighting certainly doesn't make the finishes look very good, but this should give you some idea of what they look like. It's entirely cosmetic, although a lot of people (myself included) like the feel of Gibson style binding with the nubs that go over the fret ends. Even with a router, a lot of us remove the bulk of the wood with a forsner bit because it saves wear and tear on the router (and is safer). Your edges won't be as pretty but it will work. Thanks for the comments guys, but this thread was pretty old. If a mod wants to close it that's fine - when I take pictures of the finished guitars I was going to start a new thread anyway. Yeah. People tell me it works wonders...I've done several with and several without and never heard a difference. Go figure. Oh, people who actually hear a difference always say to use copper foil rather than aluminum. Copper is more conductive than aluminum so it does make sense, but aluminum should work alright if you can't get any copper. Yup. It's hard for me to see for sure, but try attaching the purple wire to the other tab, then run a wire from the unused tab to ground. Can we get a close up of the jack? I'm pretty clueless when it comes to wiring, but I believe the fact that touching the strings stops the buzzing means it's grounded properly (that's what the wire to the bridge is for, so that's not the problem). If the cavity isn't already shielded, you could try doing that. Here's the begining part of my LP projects. I'll try to get some finished pictures up within the next couple of days. These three were my first from scratch and I had a blast. All three of them play really well, and the one with Swineshead pickups sounds absolutely unbelieveable (the other two have cheap GFS pickups and sound like crap). If I can be of any help, feel free to ask. I've bookmarked tons of resources so if you have a specific question about anything I can probably point you in the right direction. An interesting note about Ibanez' mirror finishes is that any fingerprints left on them for mroe than a few minutes become permanent. I've discovered this product called Nu Finish. It's for restoring the shine on old auto finishes. I bought it thinking it might improve the gloss of my finishes, which it did, but it also makes necks ultra slick. You might want to try some of it before you take any steel wool to the neck as I feel like this actually makes it faster. Heat will go a long way to helping. With a 30 watt soldering iron you'll still need to hold it on the fret for about 10-15 seconds before trying to lift it, maybe even more. Rather than using end nippers, buy some dedicated fret pullers from LMI or Stewmac - they're worth the money. 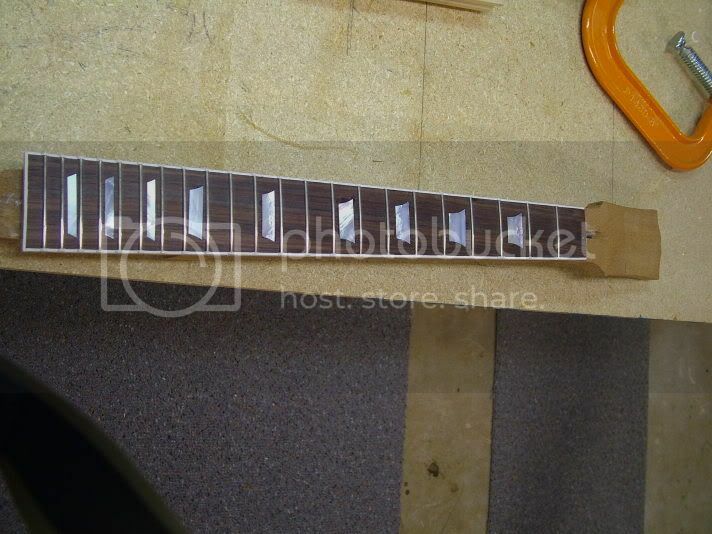 Start at one end of the fret. Work your way under it, then walk the pullers across the board to the other side, lifting a little at a time. If you get any significant chipping, you're probably doing something wrong. He came up with the idea and design of the fanned fretboard and he got a pattent on it (I assume). He can EASILY sue you if you ever try to make a profit off of it, although making one for your self is easier to get away with. Do some research on "fanned frets." There was a guy on here a couple years ago (they post is probably long gone) who actually did this. I believe they're just a different brand. I'm deffinately not an expert on either caps or vintage guitars though. Cool. I think tone wise the black beauties are supposed to be nearly identical to bumblebees anyway. The original 50's LPs didn't have long shaft pots! Either way, Specialty has them both. Which caps did you end up getting? Calum's got the right idea. 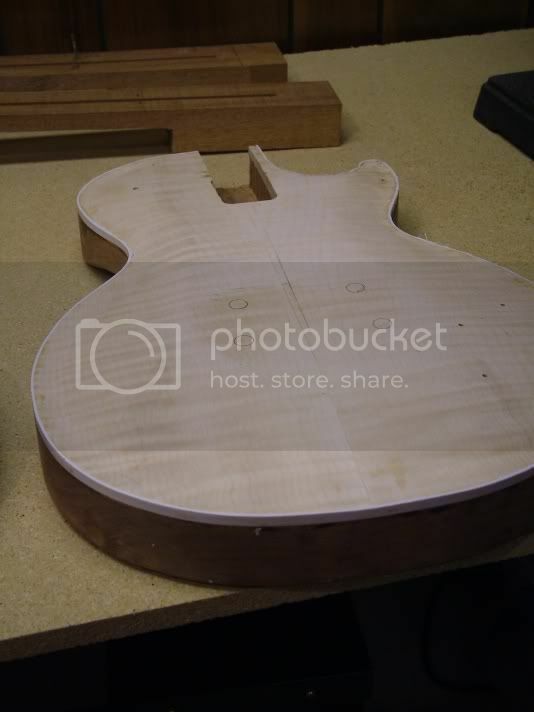 I had a similar problem the first time I assembled my Warmoth, and there was DEFFINATELY nothing wrong with the way Warmoth cut their neck pocket. Get a friend to put pressure on the neck while you adjust the screws. You may also want to shim one side of the pocket with a piece of plastic pic. If all else fails, you can reslot the saddles off center. Depends on the design of the guitar. 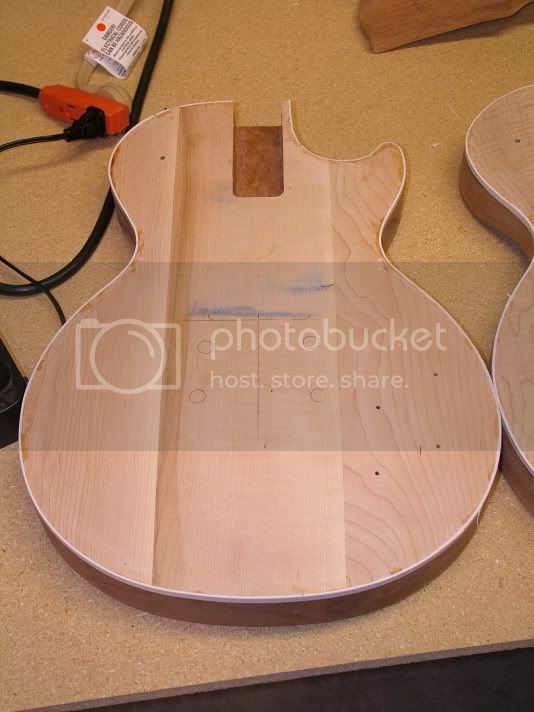 It's difficult to put an accurate angle into the neck heel after the neck has been tapered and shaped. 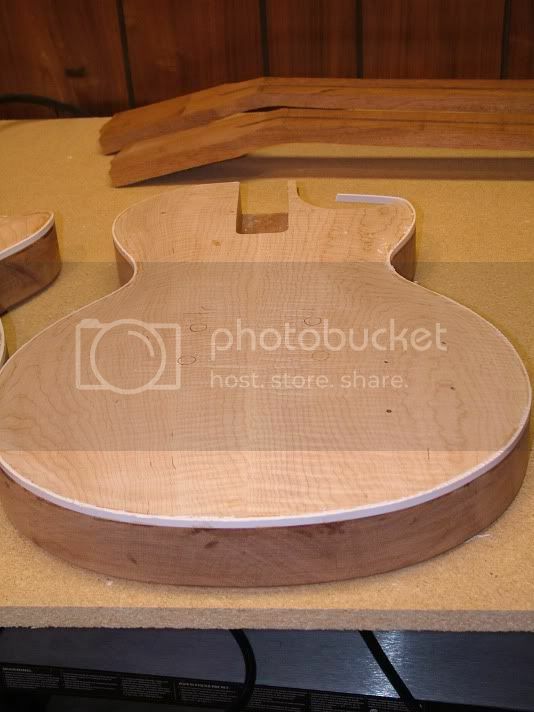 I've never used it personally, but I've seen some great results of people using tru oil on maple necks. You can get it in the gun department at Wal Mart and it simply rubs on. I'd recomend trying the dremel also, but be aware that it may melt the wrench to the point where it won't fit. Actually, a normal Floyd Rose bridge should work fine with a neck angle as long as you don't try to recess it. I retrofitted a Floyd Speedloader (same dimensions as the original) on a Charvel with a neck angle and it's fine. From tune-o-matic to floyd rose - is this possible? To get the sound you're looking for, you'll have to do a simple modification. Buy a vintage, low output humbucker -- preferably something with an alnico II magnet(s) -- and install a push-pull pot for coil tapping. That way you'll be able to turn one coil off and get the single coil sound. Or you can wire it for in phase/out of phase, which out of phase results in a nasal, thin sound. Then you can get warmer, full humbucker tones by turning the coil splitting or out of phase off. Good call. The Seymour Duncan Alnico II Pro might be a good choice for that. It apparently compensates to better intonation too. It's a good idea. Yep, your taking out the height from the nut. That would just mean your nut isn't filed deep enough. I'm not saying it's a bad idea, but lets not give it more credit than it deserves. Or you could just use the really dull chisels they sell at Home Depot like I do. :p Sure, they have a tendancy to slip, they just don't hurt much when the hit you! 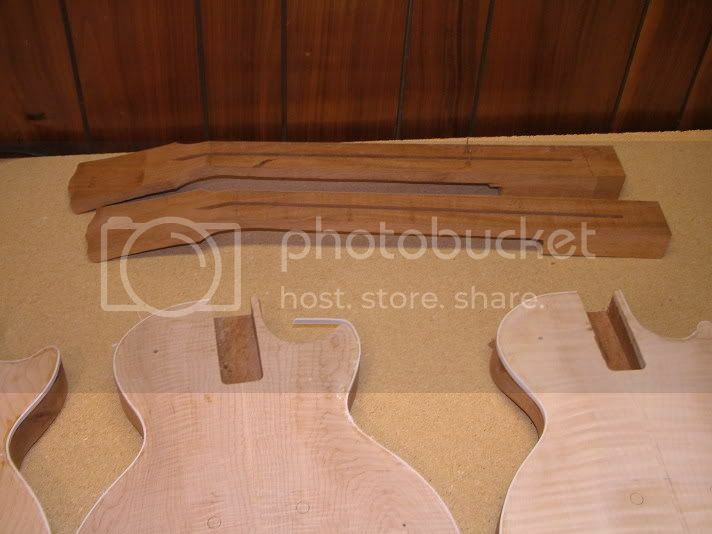 Some electric guitar necks need to have the angle corrected as a result of poorly angled neck pockets, incorrect shimming, bridge or saddle changes and other factors. Not quite. Neck angles are there on purpose because many bridges are too tall for proper string height without it. It also gets the strings off the body which some of us find a lot more comfortable. Check the stickied thread. Algee and I posted ways of calculating the correct neck angle. An underpowered router is just as dangerous as a more powerful one. Besides, 2 1/4 hp is hardly a beast. Use a sharp bit, be careful, and have someone show you the basics first and you'll be fine. hey pacman, I bought two boards of mahogany roughly 8.5" wide by 4 feet long and was able to get three bodies and three necks out of it. Depending on how wide your piece is, you may be able to do the same. If you don't need them all, glue and plane them and sell the blanks at a profit. Hitachi routers also have a VERY good reputation (especially the 2 1/4" hp model).